As a Colorado resident, you reasonably expect the law enforcement to be on your side. 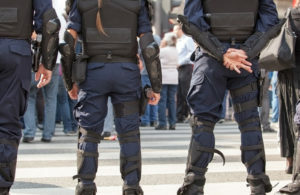 In the majority of cases, police officers in Colorado will act reasonably and in accordance with state and federal laws, giving individuals the full range of their Constitutional protections while respecting due process of law. Unfortunately, police misconduct has and does occur in Colorado, especially in Denver, which has been under the spotlight several times for police misconduct cases. One of the best ways to reduce instances of police misconduct is to report it. Filing a complaint is certainly fundamental, but perhaps one of the best ways to seek justice and (potentially) compensation is to contact a Denver CO police misconduct attorney. At the Civil Rights Litigation Group, civil rights attorney Raymond Bryant has in-depth knowledge of police misconduct laws, and our Denver law firm has the resources and litigation experience to give your case the legal backing that it deserves. To find out if you have a case, call the Civil Rights Litigation Group at (720) 515-6165. You have federally protected rights regarding police misconduct, and when police officers, deputy sheriffs, or other state and local peace officers violate your Constitutional Rights, then you may be able to file a lawsuit against the offending officer and, possibly, their municipal employers. The Fourth Amendment: Protects you against unreasonable seizures and searches as well as police brutality. The First Amendment: Guarantees freedom of speech and provides protection against retaliation, especially in whistleblower cases. Fifth and Fourteenth Amendments: Guarantees due process of law for any individual suspected of committing a crime. At the Civil Rights Litigation Group, we’ve been using 42 U.S.C. § 1983 to file police misconduct lawsuits against police officers and deputy sheriffs. Now that you have a better understanding of police misconduct and federal protections in Colorado, it’s important to look at what exactly constitutes police misconduct. In other words, how do you know if the police’s actions were a violation of your rights? Unfortunately, some cases of police misconduct are not very clear – was the individual resisting arrest, or was the police officer being excessive in his/her use of force? Although police misconduct does occur, it’s important to remember that police have highly dangerous jobs. As such, defense attorneys representing the law enforcement officer might use the Qualified Immunity Defense. This defense exists to prevent the fear of legal prosecution from affecting a police officer’s ability to enforce the law. As such, unless the law enforcement officer clearly violated a federal statute, beyond a reasonable doubt, then there might not be a civil rights case. If you were a victim of police misconduct in Denver or anywhere throught Colorado, the first step is to contact Denver police misconduct attorney Raymond K. Bryant. We offer extensive experience in these cases, as well as vigorous legal representation. We will carefully and compassionately listen to your claim, and if you have a case, we are prepared to file a lawsuit and represent your interests along every step of the way. For a free, no-obligation consultation with the Civil Rights Litigation Group, call our Denver law office today at (720) 515-6165.